The MIT Symphony Orchestra gave its first performance with a new guest conductor, David Commanday, on Saturday night. Director David Epstein, who suffered whiplash injuries in a car accident two weeks ago, will not return until the spring semester. Commanday is now in his fourth season as the Music Director of the Greater Boston Youth Symphony Orchestras. He is also Music Director of the Mozart Society Orchestra at Harvard University and guest conductor of the Boston University Chamber Orchestra. "We are very fortunate to have him on such short notice. David has a strong background with GBYSO and experience with students," said Nancy E. Cavanagh, an administrative officer in the MIT Music Office. "He knows about inspiring student musicians," agreed Parker E. Monroe, Executive Director of GBYSO. Currently conducting five orchestras at three universities, Commanday has "discovered that the atmosphere of the universities differ greatly." "MIT students are extremely conscientious about schoolwork. I hope they learn how to use music-making to increase the productivity of their study time. If you go on a different mode for a little while, you return more focused to your studies," he said. Commanday rehearsed with the orchestra only 31/2 times before Saturday's concert. One rehearsal was incomplete. "I was very impressed by the focus of the musicians in the concert. They were able to transcend practical limitations in the energy and excitement of the performance," said Commanday. 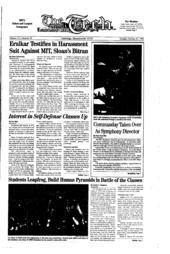 "It was delightful to discover that the MIT Symphony's good reputation was true," he added. Commanday, who studied the cello during his undergraduate years, is planning to institute more string sectionals to teach better phrasings of music. "It's my hope that during this time I can offer them my personal approach and style to music-making, particularly for the string players." he said. Commanday was chosen to direct the GBYSO director from a pool of 300 applicants in an international search, according to Monroe. Commanday was also one of four young conductors chosen for the American Repertoire Project, which showcases orchestral pieces by American composers. In 1989, he was a finalist in the Leopold Stokowski Conducting Competition. He has also won many prestigious awards. "I think he is absolutely sensational. He has a strong classical training from his years in the Vienna Academy of Music, and from his undergraduate years at Harvard," said Monroe.